It was only last week we brought the official info of the upcoming Call of Duty: Modern Warfare 3 content drop with it's two brand new Spec-Ops co-op missions. 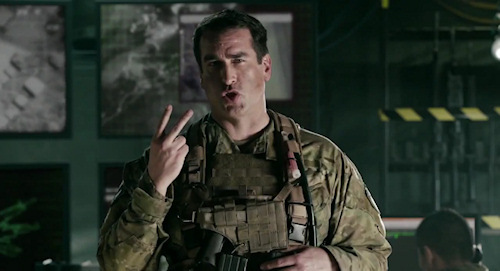 Now Actor Rob Riggle is bringing you the details of each mission, should you choose to accept it, in the latest video. The missions are Black Ice and Negotiator, take you into wildly different enviornments. Black Ice sees you in Siberia, on snow mobiles, shooting things while riding tandem. Yeah, that's awesome, if not a bit awkward as you decide to who rides in the back. Next up is Negotiator which takes you to India where you'll first need to rescue your co-op buddy (again...awkward) before taking down the hostiles in the village. Both missions are available to play in two player local or online co-op. The Black Box Map Pack is part of the first content drop which will be available on March 29th on the Xbox 360 with the PS3 and PC getting the content "at a future date." It will be free for Call of Duty Elite Members on March 14th for Free and available for an undisclosed price for everyone else.